Join us in Manchester, NH for the feature antique show of New Hampshire Antiques Week. Spanning August 5-11, 2018, NH Antiques Week is a unique opportunity to see and shop the best in Americana and folk art antiques. Mark your calendar now to attend these fantastic antique events. 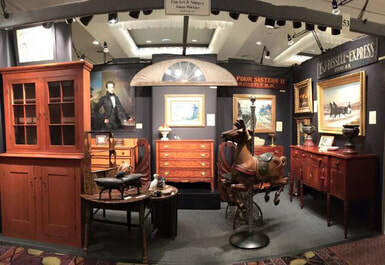 A highlight of New Hampshire Antiques Week is the Annual New Hampshire Antique Dealers Association show, now in its 61st year. NHAC's Jason Samuel Fine Art & Antiques will be exhibiting at this renowned show for the 10th year in a row. Stop by booth #53 and say hello! ​We'll keep you informed of art openings, exhibits, gallery talks, events, sales, promotions and all else that’s happening here at New Hampshire Antique Co-op.